A bestselling cable necklace chain with a premium lobster claw clasp that customers love. 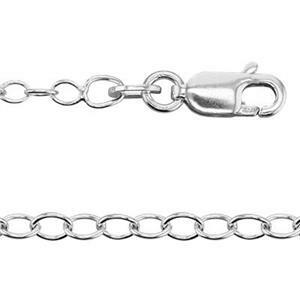 Wide open cable links easily fit charm or link Jump rings. The 2mm diameter links are strong enough to support heavier focal pieces in your necklace design. Or, easily integrate your wirework and beading into this versatile jewelry chain. I am new to this jewelry making thing but thought the quality of the chain was very good and the price was wonderful. Definitely will buy again.